No matter how cold it is outside on a winter's eve, seeing the amber glow from Josie's Cabin has to warm the visitor's spirits. 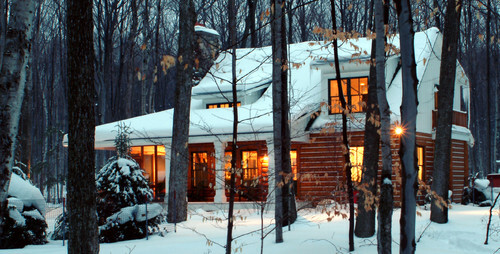 Nestled in the woods just outside of Harbor Springs, Michigan, this delightful home was built for Josie by her husband and son as a gift. I love the decor in this cabin. It speaks to my cottage-loving heart. The half-log exterior and interior is combined with 2" x 2" boards to serve as chinking. An open floor plan maximizes the small space. The vaulted ceiling, bay of high windows in the dining area and glass front cabinets visually expand the room. 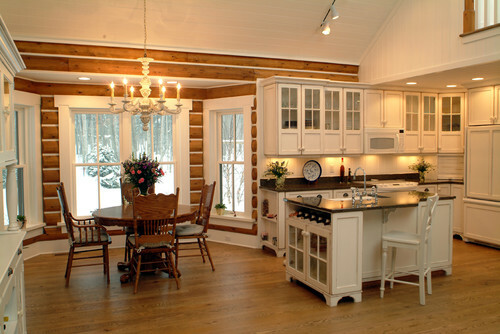 White cabinetry and trimwork keep the cabin bright and cheerful. The white beadboard ceilings are charming. And the great views just keep coming. A large screened porch with outdoor fireplace extends the living space. This is a truly beautiful cabin in a gorgeous setting. Are you feeling a Narnia vibe, or is it just me? What a beautiful living space and guest cottage. Now that is some GIFT! I want that house and so does Hubby. You just keep coming up with so many pretty cottages. Now this is the perfect 'marriage' of what my sweetheart and I both want in a cabin! He wants logs and I want cottage. He wants to hang a deer head and I want cozy with a warm, inviting feel. This one does it! I could see me being right at home there. Snow - or not - wouldn't matter! Oh my Nancy just beautiful. So cozy and inviting. Love the fireplace that is pretty awesome. Another good one this week. Have a great week end. It feels very feminine to me in a extra cozy way. I really like that. Sure were some nice men in her family. Maybe I need to revise my list for Santa. Totally magical. I love the kitchen! The warmth and glow from this cottage would make anyone feel welcome. How cozy and welcoming is this home. I would be spending hours on that back porch reading and quilting. I thought the place magical too. 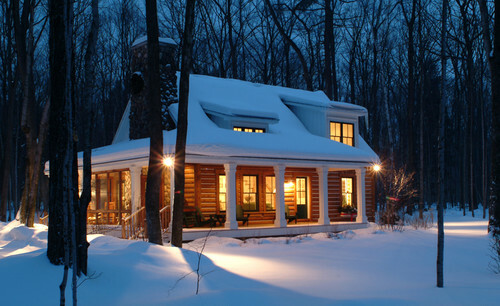 Even though there is snow piled outside, it looks very warm and inviting inside. What a gift! Josie is blessed and may she and her family enjoy this lovely home for many seasons to come. OUTSTANDING! Oh how this brings back memories of where we live now, with the snow-capped roofs and sweet cottages! I say it's a memory because we've been having unusually warm weather and the snow that did come early last week ALL MELTED AWAY! I have been wanting to take holiday photos of this beautiful city but there is not SNOW to give us that holiday feel! This is a special little house, perfectly placed and what a wonderful GIFT for a woman from her husband and son. WOW. The fireplace and views from its windows are my favorite features! Beautiful! Love the interiors, too. A cottage that lives large! A perfect Blend of Pretty and handsome. Yes! Narnia for sure! Josie must be pretty special for her son and husband to build a cabin so spectacular. It has all the things the cabin in dreams are made of!! This home is truly spectacular. 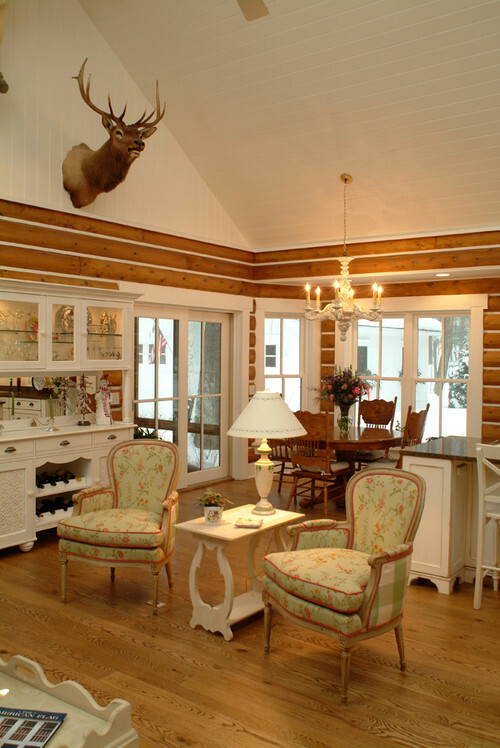 It is white, open and fresh, but definitely retains its rustic cabin roots. This is my dream combo and what I am always going for in my own home. I just don't do it as well!! Off to pin the pretty, thanks Nancy!! 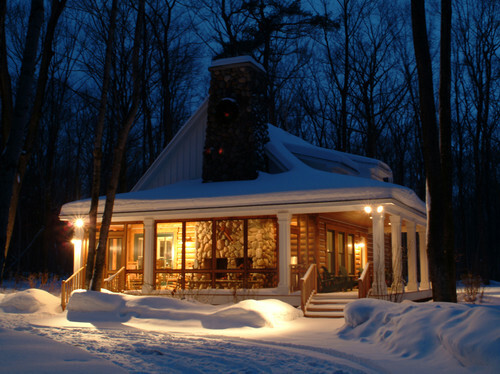 What a breathtaking winter retreat! This cabin proves a space does not have to be large to be GRAND. Thanks for sharing with us. What a beauty! 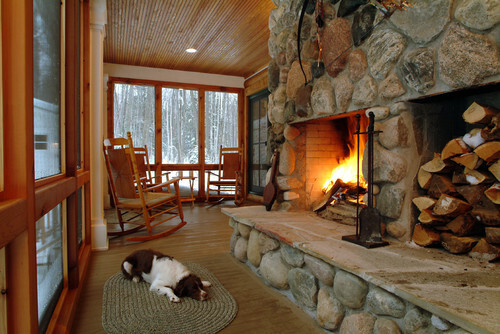 Love that porch with the fireplace and the brightening up of the logs with the white in the kitchen. Just lovely! Oh, this is a fairy tale cottage!